Hillary Clinton has been diagnosed with pneumonia, according to a note from her doctor put out by the campaign on Sunday. The revelation came just hours after she abruptly left a Sept. 11 memorial service at Ground Zero in New York City where she appeared unsteady as she departed in an SUV. The campaign said in a statement that Clinton felt "overheated." Nick Merrill, a spokesman for Clinton, said Clinton would remain at her home in Chappaqua, N.Y., to rest. A planned trip to California for events Monday and Tuesday was canceled, he said. 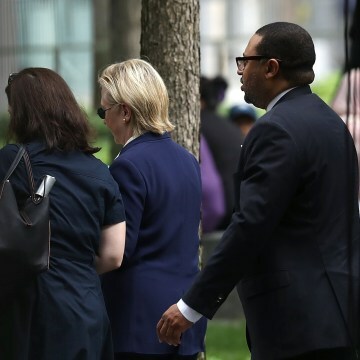 The pneumonia diagnosis was made two days ago, according to her doctor, following a widely reported "coughing fit" days earlier, which her team had blamed on "allergies." 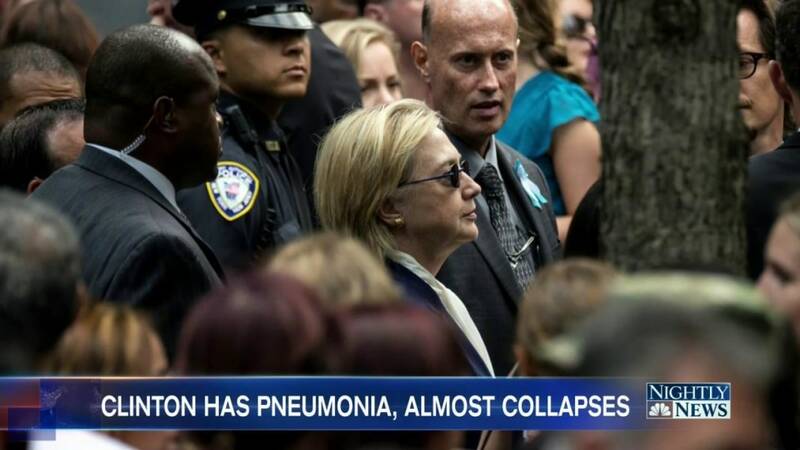 "Secretary Clinton has been experiencing a cough related to allergies," Clinton's physician, Dr. Lisa R. Bardack, in the statement Sunday afternoon. "On Friday, during follow up evaluation of her prolonged cough, she was diagnosed with pneumonia," Bardack said. "She was put on antibiotics, and advised to rest and modify her schedule. While at this morning's event, she became overheated and dehydrated. I have just examined her and she is now re-hydrated and recovering nicely." 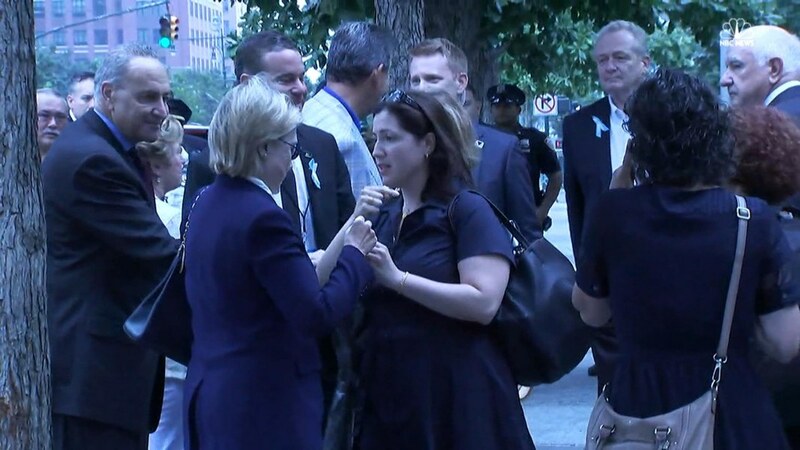 Earlier, after Clinton had left the 9/11 ceremony just an hour and a half after it began, her camp put out a statement saying, "During the ceremony, she felt overheated so departed to go to her daughter's apartment, and is feeling much better." Rival presidential candidate Donald Trump and his surrogates have persistently raised questions about Clinton's health as a potential campaign issue. 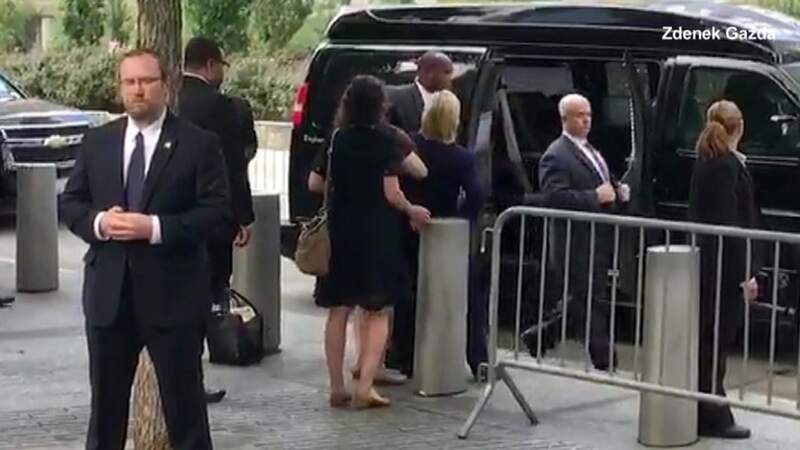 A video posted to Twitter showed Clinton getting into a vehicle looking unsteady and requiring support from an aide. Zdenek Gazda, who took the video, told NBC News that he was a firefighter in the Czech Republic and goes to the memorial to show his respect. Gazda told Buzzfeed that he moved to the states 24 years ago and is a Clinton supporter. "I take two pictures before she passed me," he said. "She looked like everything was fine and everything was good. I just saw the secretary waiting for the van and the van came and she can't walk inside and she gets helped." Rep. Joseph Crowley, D-N.Y., who was was standing next to Clinton during the ceremony, said: "It was very hot and stifling, very tight, inches from each other ... like typically would be at a ceremony like this." Clinton was taken to the apartment of her daughter, Chelsea Clinton, on the Lower East Side, sources confirmed to NBC News. 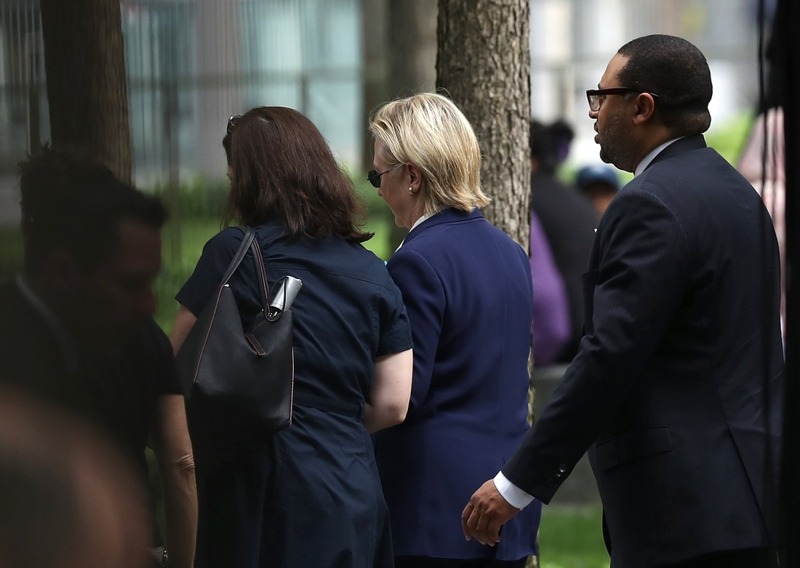 Clinton emerged from that building about two hours later, walking on her own, and waved at the gathered crowds, saying, "It's a beautiful day in New York." Asked whether she was "feeling better," Clinton said, "Yes, thank you very much." When she later returned to her home in Chappaqua, Bill Clinton was already there, having not attended the ceremony. Her running mate, Sen. Tim Kaine, was at home in Richmond, Va., according to the campaign. 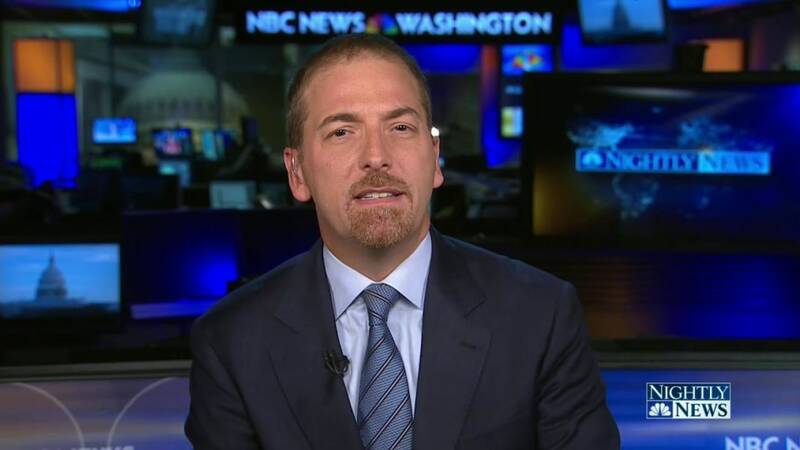 It was in Chappaqua where Bardack examined Clinton on Sunday, campaign aides said. Trump, who was also at the memorial earlier, was asked about the incident as he left a fire station in lower Manhattan, simply said, "I don't know anything about it."